1 2 3 4 5 Click to share your rating 12 ratings (3.8/5.0 average) Thanks for your vote! Is there any Galactica after this- If there is I want it! 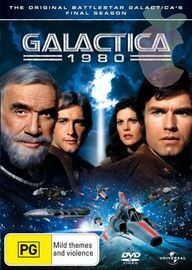 This Complete Series showcases the last epic adventures of the crew and closes the book on the original Battlestar Galactica. Incudes guest stars such as Dirk Benedict, Brion James, Dennis Haysbert and more! It's an epic adventure unlike any other, and a must-have for any Battlestar Galactica collection.